A little while ago I was having one of those days where I had too much to do and not enough time and my two little ones were wanting lots of attention. A light bulb went off and I ran to the pantry to gather my supplies. 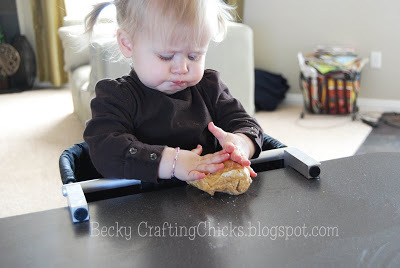 It was time for some DIY Peanut Butter Play dough (edible)! Mix the peanut butter and Karo syrup together. Sift together the dry milk and powder sugar. Add the dry mixture to the peanut butter mixture all at once. 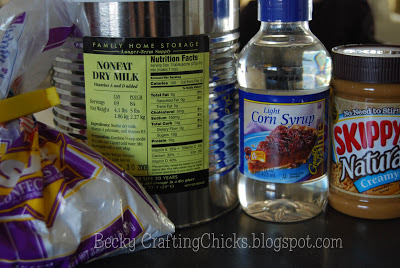 Mix it all together with a spoon and then with hands. Knead to finish making it smooth and pliable. 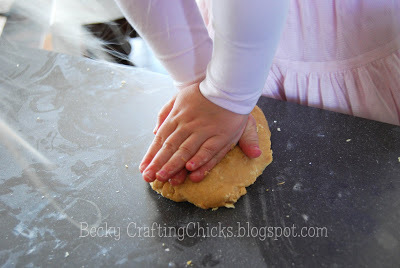 Use as you would any play dough, then the children can eat their creations. 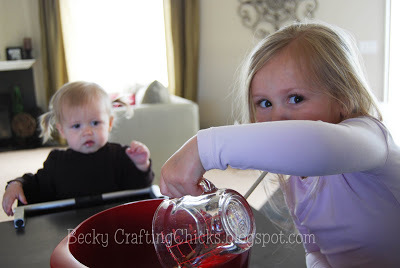 Have your kids help you measure and pour the ingredients into the bowl. You can also have them help you mix once you begin to knead by hand. Then they are ready to play and you can have a little time to get things done, or you could snag a couple nibbles of the play dough yourself. My girl’s loved it. Can you tell that my little one has a mouth full while she is playing? Thank you so much! I hate the smell of regular play dough and so I almost never let my kids play with it. Being pregnant right now, I really can’t stand the smell of it, so peanut butter play dough is perfect!